I have multiple artistic styles; it changes with my mood and the media I am working with. I am inspired by many things. Nature plays a big part, yet I can be inspired by my mood after reading or watching movies, or just observing something beautiful. 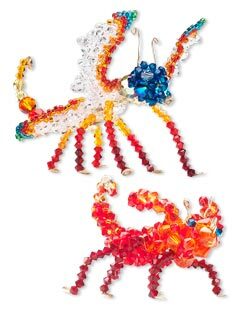 I enjoy working with Swarovski crystals and Delica beads and I love to combine many different mediums into a design. I was first inspired by fireopal Swarovski's. I came up with the idea of a ''fire bug'' and his friend after watching a Laurel and Hardy movie. I did not plan it out. It just developed as I went along. I began my love affair with beads when I strung my first lima bean necklace at summer camp when I was four. I am a self-taught artist. I have learned from many people. For example, I developed a love of seed beads at the age of nine when I went to an Ojibwa Pow Wow in upper Wisconsin and was amazed at the beautiful beaded costumes. I enjoy wood carving, dance and playing music. I have had training in all arts. On the back of a beading magazine. I do not belong to any beading groups or societies at this time. I enjoy antique shopping, gardening, photography and, of course, collecting beautiful beads for my favorite art. Beading helps me unwind at the end of a day. It is meditative. For me it is a both a hobby and a full-time career. I own a small bead shop that I work at during the day and when I get home I bead for me. I donate some of my pieces to my favorite charities and demonstrate art making at local fundraisers. On the more national level, I have sold many breast cancer awareness bracelets I made using awareness beads. My biggest advice is having confidence in your work. If it looks good to you then there is a 99.99% chance it will look good to someone else. I hear too many people tell me they don't think their jewelry is very good, when in fact, it is really beautiful. View all of Sherral's designs in the Gallery of Designs.